From I-10, take exit 265 heading South on E. Valencia Blvd. Go about 4.5 miles and turn left onto S. Nogales Hwy. You'll see the casino down about 1.5 miles miles on your right. ---- From I-19, take exit 95 heading North on W. Valencia Blvd. (which soon turns into E. Valencia Blvd.). Go about 1.5 miles and turn right onto S. Nogales Hwy. You'll see the casino down about 1.5 miles miles on your right. ---- DO NOT enter at the main entrance. Continue east past the main entrance to the next turn. Turn right (signs marked for truck and RV Parking). Go a short distance and turn right again into the RV Parking area. DO NOT enter at the main entrance. Continue east past the main entrance to the next turn. Turn right (signs marked for truck and RV Parking). 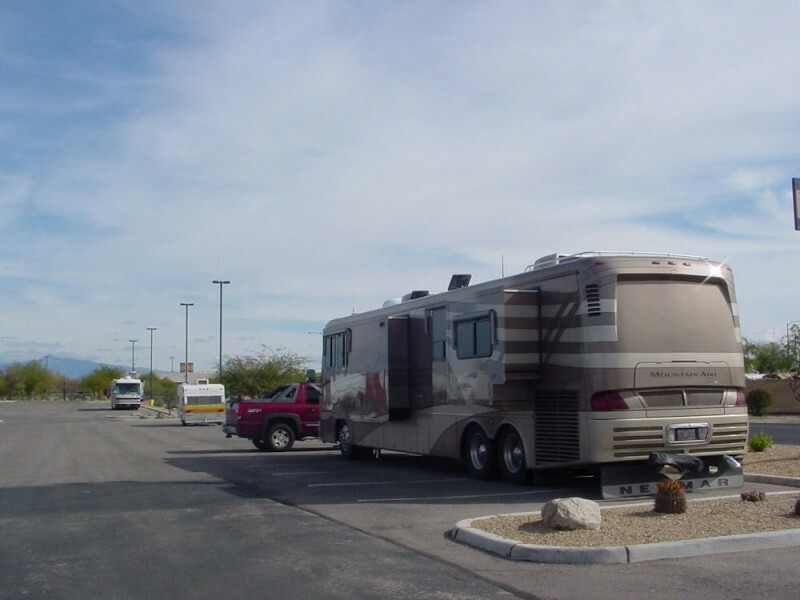 Go a short distance and turn right again into the RV Parking area. This will help you avoid the speed bumps and a tight traffic circle at the casino entrance. Friendly casino with lots os space for RV's. Stayed here for a couple nights. 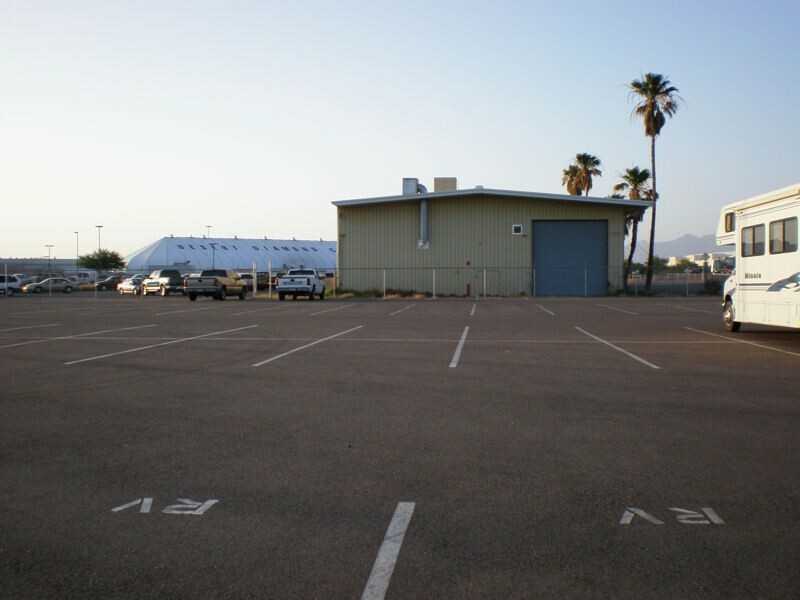 The RV parking area is a paved parking lot with plenty of room for RV's. One camper stated they had been there for over a month. It is a little noisy with a train and airport next door. The casino is okay, but full of cigarette smoke. $10 free play for new card members and $10 off food (one time). We enjoyed a good buffet for two for only $6 (normally 2 for $25) on St. Patricks Day. Food was real good (included Prime Rib). Even came away with more money than we started with. Happened to stop here on Wednesday and the Buffet was 2 for $14.99. Mostly Mexican food, and all was good. If your a Vet, the Tribute card (rewards card) includes a once a month free hotel room and $10 free play twice a month. Free concert tickets too. 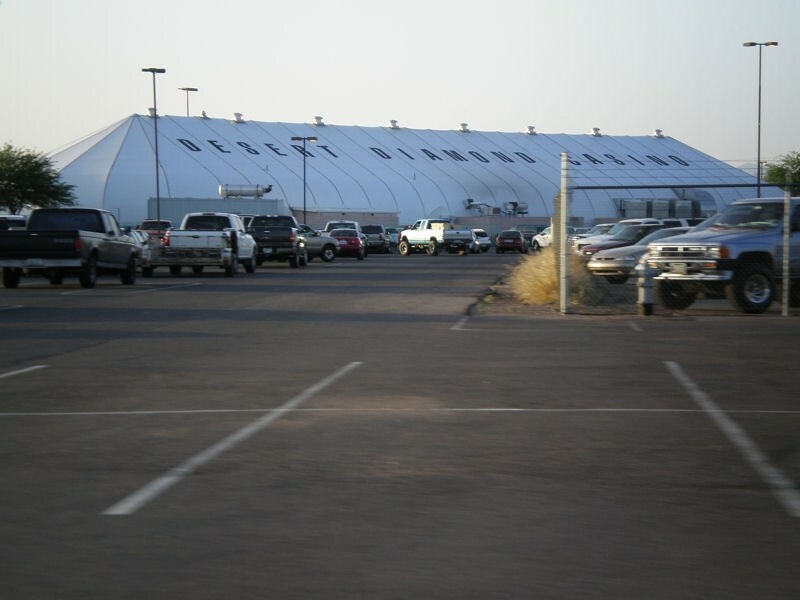 Nice flat area for parking, I had a shuttle driver show us where to park as I came in the auto park area. Early Morning airplane noise, but not bad. 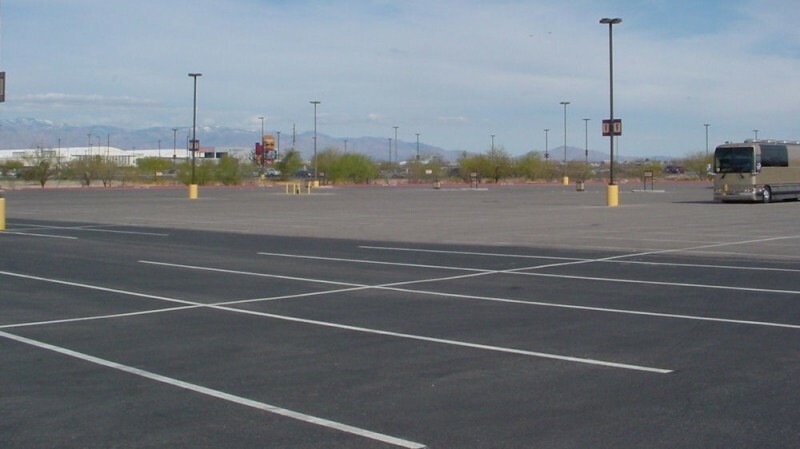 As stated in the previous report, RV parking is allowed. According to Security personnel you can get a parking pass for the week. We were told that stays less than 7 days did not require a pass. The bicycle security were around often as was the shuttle. 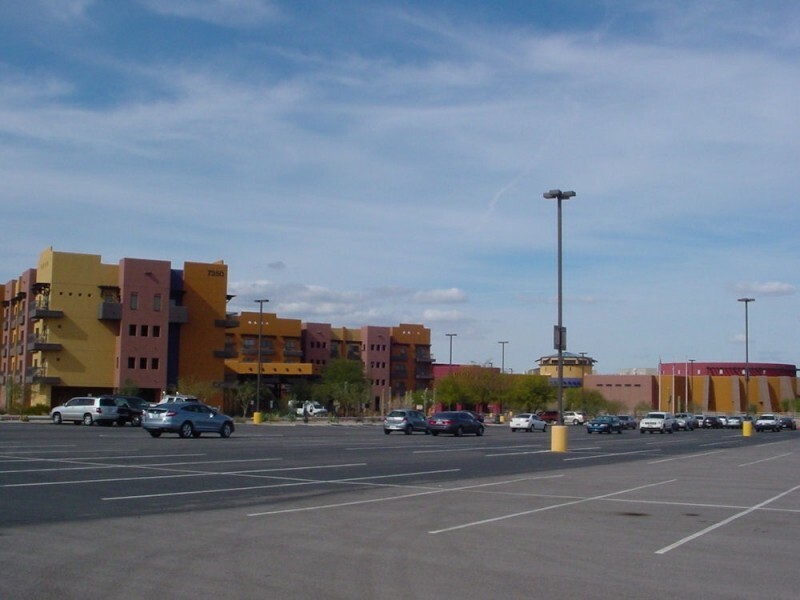 If you enter & exit using the last Casino driveway on Nogales Hwy (immediately before the CAT dealership) you will avoid speed bumps and automobile traffic. The only noise we noticed was in the AM - jets from the Air National Guard located across the street. The lunch and dinner buffets are priced right. Quality & selection was good. You may be disappointed with the limited choices of desserts. Large selection of machines. I thought the air circulation system was poor when the Casino was crowded. Would have liked a non - smoking section. Definitely will stay & play here again. The new Casino, Conference Center, and Hotel are all finished. 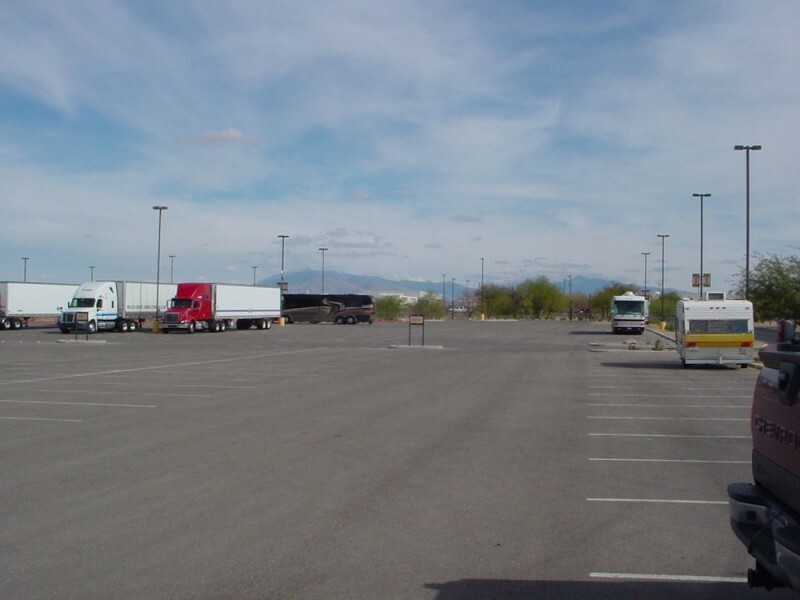 RV parking permitted in large, asphalt, level, well lighted parking lot on the south side. Some airport and railroad noise (no train horns) otherwise quiet. Shuttle is available from parking area to the casino. Watch for the speed bumps on the entrance road and in front of the buildings. Buffet food was real good and a bargain at $17.80 for two. Steak room and a food court are available if you wish. Large selection of table games and slot machines in a very large casino area. They even have a new electronic, multiplayer, video craps machine that was very popular. It is a smoking casino but the air circulation system kept the air very breathable.